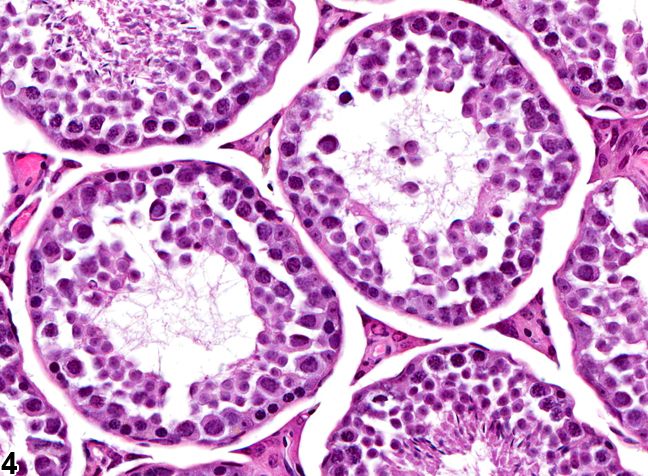 Testis, Germinal epithelium - Degeneration in a male F344/N rat from a chronic study. Various degenerative changes are present in multiple seminiferous tubules. 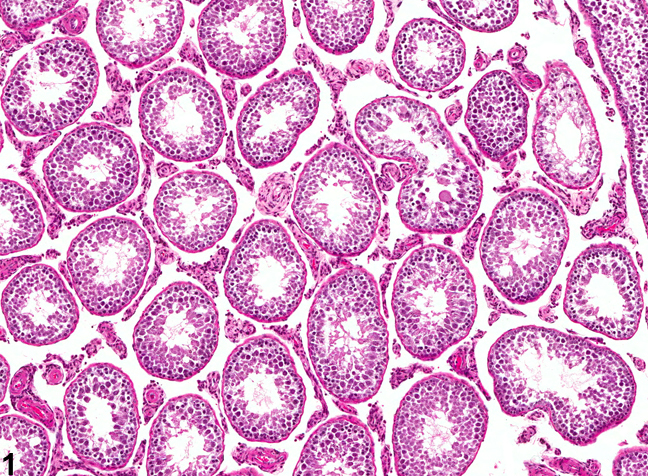 Testis, Germinal epithelium - Degeneration in a male F344/N rat from a chronic study. This figure shows disorganized arrangement of germ cells in seminiferous tubules. 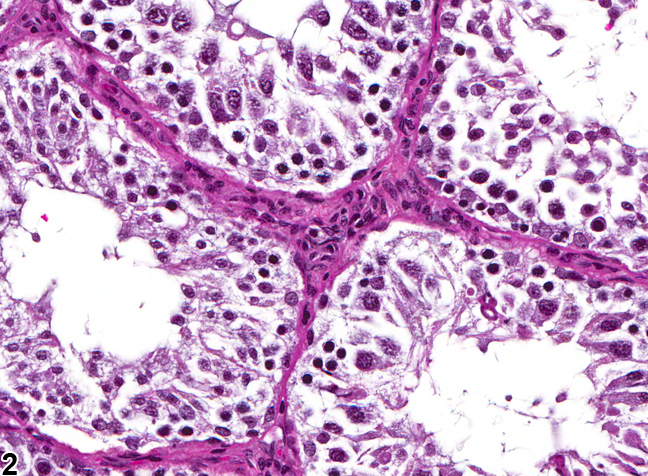 Testis, Germinal epithelium - Degeneration in a male B6C3F1/N mouse from a subchronic study. 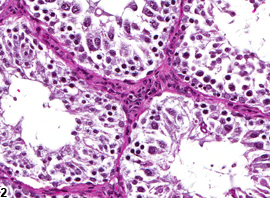 Degeneration is characterized by disorganized arrangement of germ cells in seminiferous tubules, vacuolation, and the presence of multinucleated germ cells. 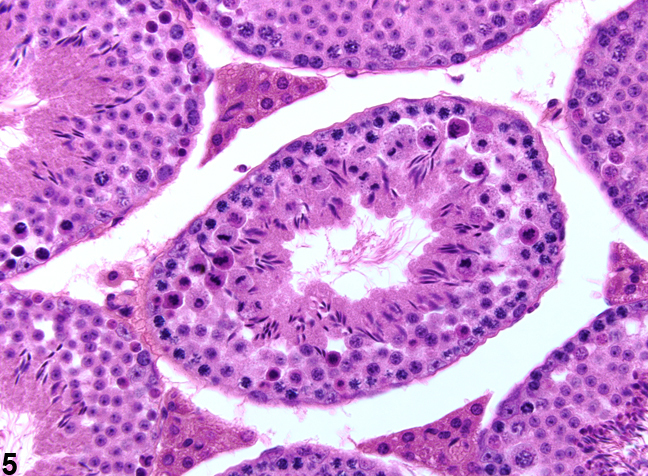 Testis, Germinal epithelium - Degeneration in a male B6C3F1/N mouse from a subchronic study. A normal spectrum of germ cells is absent in seminiferous tubules owing to germ cell depletion. Testis, Germinal epithelium - Degeneration in a male BALB/c mouse 12 hours after exposure. Germ-cell-specific degeneration affecting dividing spermatocytes in a stage XII seminiferous tubule. 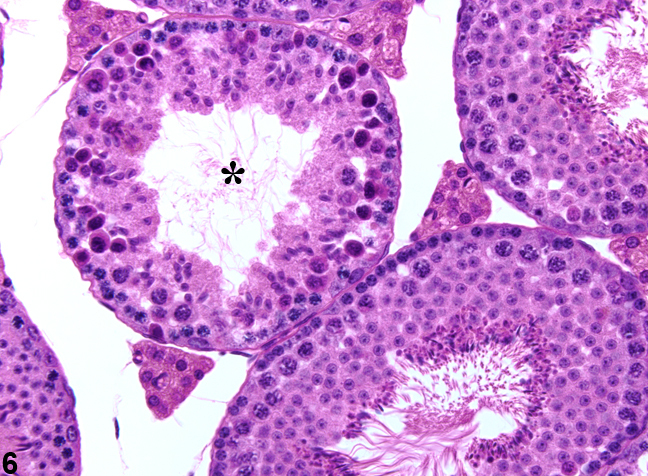 Testis, Germinal epithelium - Degeneration in a male BALB/c mouse 12 hours after exposure. Germ-cell-specific degeneration of pachytene spermatocytes in a stage X tubule (asterisk). Germinal epithelium degeneration is a nonspecific term that generally includes a number of degenerative features, such as tubular vacuolation, partial or segmental depletion of germ cells, degenerating (multinucleated or apoptotic) germ cells generally not restricted to a specific germ cell type or stage, and disordered arrangement of the germ cell layers ( Figure 1 , Figure 2 , Figure 3 , and Figure 4 ). Depending on severity, there may be a macroscopic reduction in size of the testis and a reduction in organ weight. 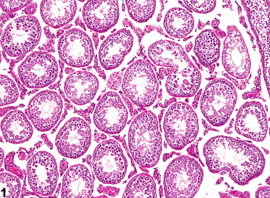 The condition may progress to total loss of germ cells, leaving contracted tubules lined only by Sertoli cells (see Testis, Germinal Epithelium - Atrophy). Frequently, there is a mixed effect on seminiferous tubules, with some showing degeneration and others having progressed to atrophy. Chemically induced germinal epithelium degeneration can be multifocal in distribution, but it is most often a bilateral lesion that affects most of the seminiferous tubules to varying degrees ( Figure 1 ). It can also be an incidental background finding in rats and mice of any age, but the incidence increases with age. Depending upon the toxicant, in short-duration studies (~14-28 days) the earliest evidence of germinal epithelium degeneration may be preceded by specific degenerative features, such as vacuolation or cell- and stage -specific degeneration/depletion of germ cells. In routine toxicity studies, germinal epithelium degeneration should be diagnosed and graded and should be discussed in the pathology narrative if it is considered the primary change and if the incidence and/or severity appears to be related to chemical administration. 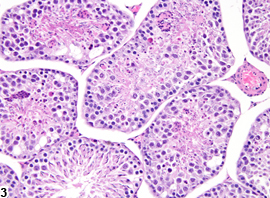 If both testes are affected, the diagnosis should indicate the condition is bilateral, and severity should be based on the more severely affected testis. Since degeneration is thought to be a precursor to atrophy, degeneration should be diagnosed unless the majority of the tubules are devoid of germ cells, in which case atrophy is the preferred diagnosis. 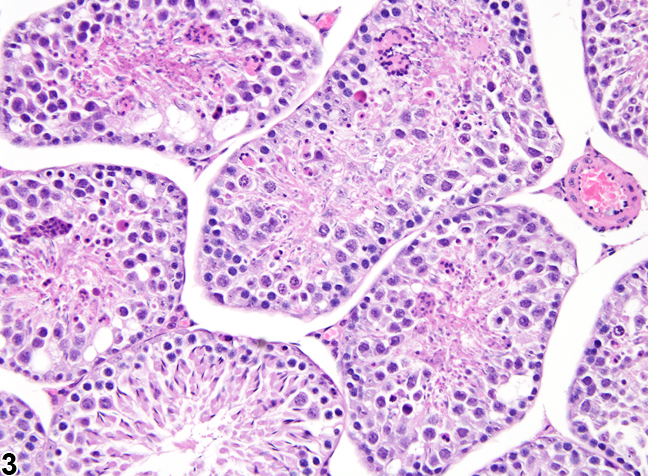 The concomitant presence of some germinal epithelium atrophy or evidence that germ cell–specific degeneration/depletion is present can be mentioned in the pathology narrative. If both terms are used in a single study, it is incumbent upon the pathologist to describe the relationship between the two lesions in the pathology narrative. Boorman GA, Chapin RE, Mitsumori K. 1990. Testis and epididymis. In: Pathology of the Fischer Rat: Reference and Atlas (Boorman GA, Eustis SL, Elwell MR, Montgomery CA, MacKenzie WF, eds). Academic Press, San Diego, 405-418. Lee KP, Frame SR, Sykes GP, Valentine R. (1993). Testicular degeneration and spermatid retention in young male rats. Toxicol Pathol 21:292-302. Radovsky A, Mitsumori K, Chapin RE. 1999. Male reproductive tract. In: Pathology of the Mouse: Reference and Atlas (Maronpot RR, Boorman GA, Gaul BW, eds). Cache River Press, Vienna, IL, 381-407. Takano H, Kazuhiro ABE. 1987. Age-related histologic changes in the adult mouse. Testis. Arch Histol Jpn 50:533-544. Yuan Y-D, McEntee K. 1987. Testicular degeneration, rat. In: Monographs on Pathology of Laboratory Animals: Genital System (Jones TC, Mohr U, Hunt RD, eds). Springer, Berlin, 212-217.